Spice up your special event ! A Pole Dance Ireland portable dance pole is perfect for any party and occasion. Add that extra glamour and fun to your party or event. 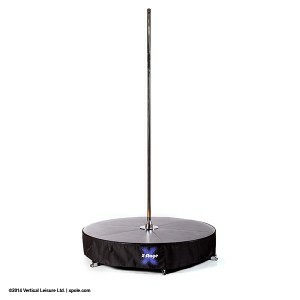 Pole Dance Ireland has several poles available to rent that can accommodate any room from 7ft – 9ft. Fully removable no screws or bolts works on pressure! 100% safe and professional. Full instructions & dvd to start you on the path to becoming a Pole Diva! Rates are €75 for a 6 night rental. A Pole Dance Ireland Xstage is perfect for the venue that doesn’t have a low ceiling. Pole Dance Irelands Xstage has a 50mm pole & can accommodate any room height. Stage hire includes a professional rigger to deliver, install and dismantle the stage. The X-STAGE can function as both a static and spinning pole and features a large 1.6m circular dance platform area with no corners or sharp edges and a 3m high dance pole. Our Aerial Hoop are professionally manufactured from high quality steel and all have been certified and strength tested at an external facility. Our hoop for rental is single point, black taped and 100cm. Our hoop comes taped and with caribiners, a swivel and various thin mountain climing straps suitable to hang a hoop.